The MA Chidambaram Stadium in Chennai witnessed a thriller of a match as Chennai Super Kings went on to beat the Rajasthan Royals by 8 runs. After winning the toss, Rajasthan Royals elected to bowl first and the hosts lost early wickets. But MS Dhoni’s 75 runs from 46 balls under pressure led the team to a total of 175 runs. In reply, Rajasthan Royals were eight runs short from victory and suffered their third consecutive defeat in the IPL 2019. After winning the match, a few members of team CSK including MS Dhoni, Imran Tahir, Shane Watson went on to bond with the players of Rajasthan Royals. Captain Cool MS Dhoni even went on to sign an autograph for Rajasthan Royals’ all-rounder Krishanappa Gowtham. Imran Tahir was seen talking about the bowling tactics to a few players from RR, whereas, Shane Watson was seen chatting with Steve Smith. The pictures and the video of the bonding session between the players of Rajasthan Royals and Chennai Super Kings were shared on Chennai Super Kings’ social media. Talking about the match yesterday, Ajinkya Rahane and Jos Buttler made way to the pavilion quite early in the game as they scored 0 and 6 respectively. Sanju Samson also scored in single digit. 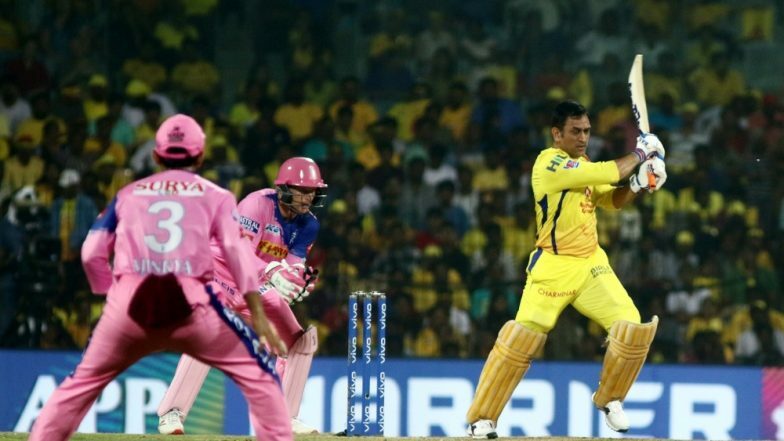 Rahul Tripathi, Steve Smith, Ben Stokes and Jofra Archer were the ones who got the team close to the total, but in the end, the visitors fell short of eight runs and CSK clinched the victory.